It’s been three days now since we left for Koh Lanta but I didn’t have time to post something till now as we had no internet. The night before we left was a bad one. I slept badly due to heavy rain. I always thought: if it rains like this tomorrow morning we’ll be soaking wet until we’ve even reach the street from our hut. And when I slept I dreamt about missing the ferry. Morning saw my fears confirmed.It was raining and we were on a tight schedule anyway: the ferry was a 30 minutes walk away, just in case we wouldn’t get a taxi. It was due to leave at 7.15 am and we got up at 6 am and wanted to leave at 6.30 am. Of course it was 6.40 am till we finally hit the road. And of course at that time there was no taxi to be seen but at least the rain had stopped. So we started walking, being not as quick as we hoped with our backpacks and lots of water on the road but what else could we do? We had walked for 20 minutes when suddenly a pickup appeared. A nice Thai couple offered us to jump on the back as they where going to the pier anyway and took us there for free (first luck of the day) and we arrived in time to take the ferry. The ferry ride was a bumpy one with quite some waves. But in contrast to many of the other passengers we at least didn’t get seasick (second luck of the day). Arriving on the mainland we got sorted again, send to two more places to get mixed up again and send on. The bus from Surat Thani to Krabi was crappy and old but the minibus taking us from there was ok so we arrived in Koh Lanta according to schedule (5.30 pm, third luck of the day as it was still daylight and schedules here are normally only guidelines, not exact times). And then it happened: our minibus driver only managed to leave the ferry before realising he had a flat tire. Any actions of the driver and of the male passengers didn’t help (just as if we were casted for a role model play, we girls stood there watching the guys’ efforts.) so in the end a pickup driver send by the travel company picked us up. We were supposed to be dropped at the ferry town and than make our way down to the beaches we had chosen on our own expense. But we were able to convince the driver to drop us of at our chosen destinations for free (fourth luck of the day). Two Greeks who had chosen the same beach as we had, showed us the way to some bungalows that had been recommended to them. So we ended up at Sea Shell Bungalows in a bamboo hut for 400 Baht per night (after some bargaining), which in this touristy spot is quite a good price (fifth luck of the day). After a day on the beach on our first day we were ready to explore the island a bit more and today we went on a boat trip. So: more later and otherwise: good evening Koh Lanta! 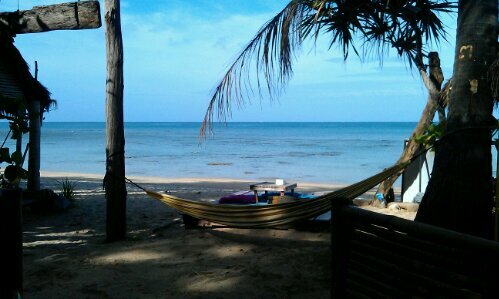 This entry was posted in Thailand and tagged Koh Lanta, Travelling by kathatravelling. Bookmark the permalink.